Apart from the ideas of federation, confederation, or customs union such as Winston Churchill's 1946 call for a "United States of Europe", the original development of the European Union was based on a supranational foundation that would "make war unthinkable and materially impossible" and reinforce democracy amongst its members as laid out by Robert Schuman and other leaders in the Schuman Declaration (1950) and the Europe Declaration (1951). This principle was at the heart of the European Coal and Steel Community (ECSC) (1951), the Treaty of Paris (1951), and later the Treaty of Rome (1958) which established the European Economic Community (EEC) and the European Atomic Energy Community (EAEC). The ECSC expired in 2002, while the EAEC maintains a distinct legal identity despite sharing members and institutions. 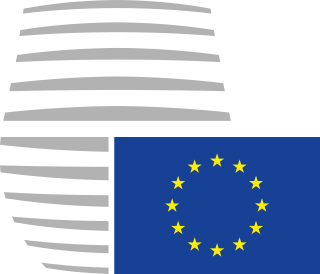 The Maastricht Treaty (1992) created the European Union with its pillars system, including foreign and home affairs alongside the European Community. This in turn led to the creation of the single European currency, the euro (launched 1999). The Maastricht Treaty has been amended by the treaties of Amsterdam (1997), Nice (2001) and Lisbon (2007). The original development of the European Union was based on a supranational foundation that would "make war unthinkable and materially impossible" A peaceful means of some consolidation of European territories used to be provided by dynastic unions; less common were country-level unions, such as the Polish–Lithuanian Commonwealth and Austro-Hungarian Empire. In the Congress of Aix-la-Chapelle of 1818, Tsar Alexander, as the most advanced internationalist of the day, suggested a kind of permanent European union and even proposed the maintenance of international military forces to provide recognised states with support against changes by violence. An example of an organisation formed to promote the association of states between the wars to promote the idea of European union is the Pan-Europa movement. 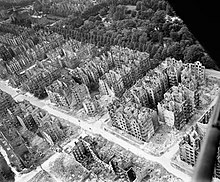 World War II from 1939 to 1945 saw a human and economic catastrophe which hit Europe hardest. It demonstrated the horrors of war, and also of extremism, through the Holocaust and the atomic bombings of Hiroshima and Nagasaki. Once again, there was a desire to ensure it could never happen again, particularly with the war giving the world nuclear weapons. Most European countries failed to maintain their Great Power status, with the exception of the USSR, which became a superpower after World War II and maintained the status for 45 years. This left two rival ideologically opposed superpowers. With statements such as Winston Churchill's 1946 call for a "United States of Europe" becoming louder, the Council of Europe was established in 1949 as the first pan-European organisation. In the year following, on 9 May 1950, the French Foreign Minister Robert Schuman proposed a community to integrate the coal and steel industries of Europe – these being the two elements necessary to make weapons of war. (See: Schuman declaration). 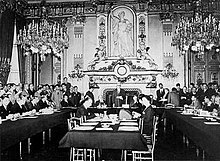 On the basis of that speech, France, Italy, the Benelux countries (Belgium, Netherlands and Luxembourg) together with West Germany signed the Treaty of Paris (1951) creating the European Coal and Steel Community the following year; this took over the role of the International Authority for the Ruhr and lifted some restrictions on German industrial productivity. 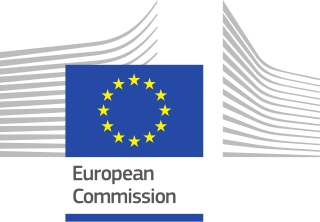 It gave birth to the first institutions, such as the High Authority (now the European Commission) and the Common Assembly (now the European Parliament). The first presidents of those institutions were Jean Monnet and Paul-Henri Spaak respectively. WikiLeaks documents revealed on 8 May 2009 show that at the Bilderberg Group in 1955, there was support for a single European currency (i.e. 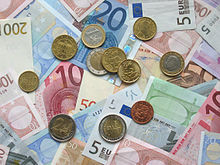 the euro) and for a common market in Europe with lower tariff rates than those outside of the common market, and greater pan-European integration, based on the then six members of the European Coal and Steel Community, "particularly with regard to the industrial utilization of atomic energy." After failed attempts at creating defence (European Defence Community) and political communities (European Political Community), leaders met at the Messina Conference and established the Spaak Committee which produced the Spaak report. The report was accepted at the Venice Conference (29 and 30 May 1956) where the decision was taken to organise an Intergovernmental Conference. The Intergovernmental Conference on the Common Market and Euratom focused on economic unity, leading to the Treaties of Rome being signed in 1957 which established the European Economic Community (EEC) and the European Atomic Energy Community (Euratom) among the members. While the political progress of the Communities was hesitant in the 1960s, this was a fertile period for European legal integration. Many of the foundational legal doctrines of the Court of Justice were first established in landmark decisions during the 1960s and 1970s, above all in the Van Gend en Loos decision of 1963 that declared the "direct effect" of European law, that is to say, its enforceability before national courts by private parties. Other landmark decisions during this period included Costa v ENEL, which established the supremacy of European law over national law and the "Dairy Products" decision, which declared that general international law principles of reciprocity and retaliation were prohibited within the European Community. After much negotiation, and following a change in the French Presidency, Denmark, Ireland and the United Kingdom (with Gibraltar) eventually joined the European Communities on 1 January 1973. This was the first of several enlargements which became a major policy area of the Union (see: Enlargement of the European Union). In 1979, the European Parliament held its first direct elections by universal suffrage. 410 members were elected, who then elected the first female President of the European Parliament, Simone Veil. A further enlargement took place in 1981 with Greece joining on 1 January, six years after applying. In 1982, Greenland voted to leave the Community after gaining home rule from Denmark (See also: Special member state territories and the European Union). Spain and Portugal joined (having applied in 1977) on 1 January 1986 in the third enlargement. 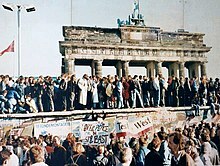 The Iron Curtain's fall enabled the accession of the DDR (Berlin Wall). Recently appointed Commission President Jacques Delors (Delors Commission) presided over the adoption of the European flag by the Communities in 1986. In the first major revision of the treaties since the Merger Treaty, leaders signed the Single European Act in February 1986. The text dealt with institutional reform, including extension of community powers – in particular in regarding foreign policy. It was a major component in completing the single market and came into force on 1 July 1987. In 1987 Turkey formally applied to join the Community and began the longest application process for any country. In Central Europe, after 1988 Polish strikes and Polish Round Table Agreement in 1989, the Berlin Wall fell, along with the Iron Curtain. Germany reunified and the door to enlargement to the former Eastern Bloc was opened (See also: Copenhagen Criteria). On 1 November 1993, under the third Delors Commission, the Maastricht Treaty became effective, creating the European Union with its pillar system, including foreign and home affairs alongside the European Community. The 1994 European elections were held resulting in the Socialist group maintaining their position as the largest party in Parliament. The Council proposed Jacques Santer as Commission President but he was seen as a second choice candidate, undermining his position. Parliament narrowly approved Santer but his commission gained greater support, being approved by 416 votes to 103. Santer had to use his new powers under Maastricht to flex greater control over his choice of Commissioners. They took office on 23 January 1995. On 30 March 1994, accession negotiations concluded with Austria, Sweden and Finland. Meanwhile, Norway, Iceland and Liechtenstein joined the European Economic Area (which entered into force on 1 January 1994), an organisation that allowed European Free Trade Association states to enter the Single European Market. The following year, the Schengen Agreement came into force between seven members, expanding to include nearly all others by the end of 1996. The 1990s also saw the further development of the euro. 1 January 1994 saw the second stage of the Economic and Monetary Union of the European Union begin with the establishment of the European Monetary Institute and at the start of 1999 the euro as a currency was launched and the European Central Bank was established. On 1 January 2002, notes and coins were put into circulation, replacing the old currencies entirely. During the 1990s, the conflicts in the Balkans gave impetus to developing the EU's Common Foreign and Security Policy (CFSP). The EU failed to react during the beginning of the conflict, and UN peacekeepers from the Netherlands failed to prevent the Srebrenica massacre (July 1995) in Bosnia and Herzegovina, the largest mass murder in Europe since the Second World War. The North Atlantic Treaty Organization (NATO) finally had to intervene in the war, forcing the combatants to the negotiation table. The early foreign policy experience of the EU led to foreign policy being emphasised in the Treaty of Amsterdam (which created the High Representative). However, any success was overshadowed by the budget crisis in March 1999. The Parliament refused to approve the Commission's 1996 community's budget on grounds of financial mismanagement, fraud and nepotism. With Parliament ready to throw them out, the entire Santer Commission resigned. The post-Delors mood of euroscepticism became entrenched with the Council and Parliament constantly challenging the Commission's position in coming years. In the following elections, the Socialists lost their decades-old majority to the new People's Party and the incoming Prodi Commission was quick to establish the new European Anti-fraud Office (OLAF). Under the new powers of the Amsterdam Treaty, Prodi was described by some as the 'First Prime Minister of Europe'. On 4 June, Javier Solana was appointed Secretary General of the Council and the strengthened High Representative for the Common Foreign and Security Policy admitted the intervention in Kosovo – Solana was also seen by some as Europe's first Foreign Minister. The Nice Treaty was signed on 26 February 2001 and entered into force on 1 February 2003 which made the final preparations before the 2004 enlargement to 10 new members. On the 10–13 June 2004, the 25 member states participated in the largest trans-national election in history (with the second largest democratic electorate in the world). The result of the sixth Parliamentary election was a second victory for the European People's Party-European Democrats group. It also saw the lowest voter turnout of 45.5%, the second time it had fallen below 50%. On 22 July 2004, José Manuel Barroso was approved by the new Parliament as the next Commission President. However, his new team of 25 Commissioners faced a tougher road. With Parliament raising objections to a number of his candidates he was forced to withdraw his selection and try once more. The Prodi Commission had to extend their mandate to the 22 November after the new line-up of commissioners was finally approved. A proposed constitutional treaty was signed by plenipotentiaries from EU member states on 28 October 2004. The document was ratified in most member states, including two positive referendums. The referendums that were held in France and the Netherlands failed however, killing off the treaty. The European Council agreed that the constitution proposal would be abandoned, but most of its changes would be retained in an amending treaty. On 13 December 2007 the treaty was signed, containing opt-outs for the more eurosceptic members and no state-like elements. The Lisbon treaty finally came into force on 1 December 2009. It created the post of President of the European Council and significantly expanded the post of High Representative. After much debate about what kind of person should be President, the European Council agreed on a low-key personality and chose Herman Van Rompuy while foreign policy-novice Catherine Ashton became High Representative. The 2009 elections again saw a victory for the European People's Party, despite losing the British Conservatives who formed a smaller eurosceptic grouping with other anti-federalist right wing parties. Parliament's presidency was once again divided between the People's Party and the Socialists, with Jerzy Buzek elected as the first President of the European Parliament from an ex-communist country. Barroso was nominated by the Council for a second term and received backing from EPP who had declared him as their candidate before the elections. However, the Socialists and Greens led the opposition against him despite not agreeing on an opposing candidate. Parliament finally approved Barroso II, though once more several months behind schedule. In 2007, the fifth enlargement completed with the accession of Romania and Bulgaria on 1 January 2007. Also, in 2007 Slovenia adopted the euro, Malta and Cyprus in 2008 and Slovakia in 2009. However trouble developed with existing members as the eurozone entered its first recession in 2008. Members cooperated and the ECB intervened to help restore economic growth and the euro was seen as a safe haven, particularly by those outside such as Iceland. The European Union received the 2012 Nobel Peace Prize for having "contributed to the advancement of peace and reconciliation, democracy and human rights in Europe." 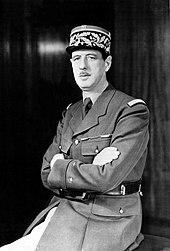 The Nobel Committee stated that "that dreadful suffering in World War II demonstrated the need for a new Europe [...] today war between Germany and France is unthinkable. This shows how, through well-aimed efforts and by building up mutual confidence, historical enemies can become close partners." The Nobel Committee's decision was subject to considerable criticism. On 1 July 2013, Croatia joined the EU, and on 1 January 2014 the French Indian Ocean territory of Mayotte was added as an outermost region. On 23 June 2016, the citizens of the United Kingdom voted to withdraw from the European Union in a referendum and subsequently became the first member to trigger Article 50 of the Treaty on European Union (TEU). The vote was in favour of leaving the EU by a margin of 51.9% in favour to 48.1% against. ^ R. R. Palmer. A History of the Modern World. p. 461. ^ "Problem while searching in History". digicoll.library.wisc.edu. Retrieved 28 July 2016. ^ Lecourt, Robert (1976). L'Europe des juges. Bruxelles, Bruylant. Stein, Eric (1981). 'Lawyers, Judges and the Making of a Transnational Constitution.' American Journal of International Law 75(1): 1-27. Weiler, Joseph H. H. (1991). 'The Transformation of Europe.' Yale Law Journal 100: 2403-2483. ^ ECJ Cases 90&91/63, Commission v Luxembourg & Belgium. See e.g. Phelan, William (2016). 'Supremacy, Direct Effect, and Dairy Products in the Early History of European law.' International Journal of Constitutional Law 14: 6-25. ^ "The crisis of the Santer Commission". Centre Virtuel de la Connaissance sur l'Europe (CVCE). Retrieved 29 January 2013. ^ Hoskyns, Catherine; Michael Newman (2000). Democratizing the European Union: Issues for the twenty-first Century (Perspectives on Democratization). Manchester University Press. pp. 106–7. ISBN 978-0-7190-5666-6. ^ Topan, Angelina (30 September 2002). "The resignation of the Santer-Commission: the impact of 'trust' and 'reputation'". European Integration online Papers. Retrieved 7 October 2007. ^ "EU Budget Fraud". politics.co.uk. Archived from the original on 19 June 2006. Retrieved 7 October 2007. ^ "Slovenia clear to adopt the euro". British Broadcasting Corporation. 16 June 2006. Retrieved 18 January 2009. ^ "Cyprus and Malta set to join Eurozone in 2008". euractiv.com. 16 May 2007. Archived from the original on 18 October 2007. Retrieved 19 January 2009. ^ "European leaders agree crisis rescue at summit". Eubusiness.com. Archived from the original on 13 October 2008. Retrieved 2 January 2009. ^ Gaspers, Jan (December 2012). "The European Union and the Nobel Peace Prize: A Criteria-Based Assessment" (PDF). Retrieved 19 December 2012. ^ "EUROPEAN COUNCIL DECISION of 11 July 2012 amending the status of Mayotte with regard to the European Union". europa.eu. ^ "Labour leadership & Hammond in China - BBC News". Retrieved 23 July 2016. Berend, Ivan T. The History of European Integration: A New Perspective. (Routledge, 2016). Blair, Alasdair. The European Union since 1945 (Routledge, 2014). Chaban, N. and M. Holland, eds. Communicating Europe in Times of Crisis: External Perceptions of the European Union (2014). Hobolt, Sara B. "The Brexit vote: a divided nation, a divided continent." Journal of European Public Policy (2016): 1-19. Jorgensen, Knud Erik, et al., eds. The SAGE Handbook of European Foreign Policy (Sage, 2015). Kaiser, Wolfram. "From state to society? The historiography of European integration." in Michelle Cini, and Angela K. Bourne, eds. Palgrave Advances in European Union Studies (Palgrave Macmillan UK, 2006). pp 190–208. Kaiser, Wolfram, and Antonio Varsori, eds. European Union history: themes and debates (Springer, 2016). Koops, TJ. and G. Macaj. The European Union as a Diplomatic Actor (2015). McCormick, John. Understanding the European Union: a concise introduction (Palgrave Macmillan, 2014). May, Alex. Britain and Europe since 1945 (1999). Marsh, Steve, and Hans Mackenstein. The International Relations of the EU (Routledge, 2014). Young, John W. Britain, France, and the unity of Europe, 1945-1951 (Leicester University, 1984). 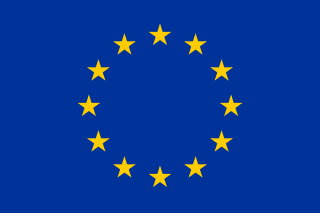 Wikimedia Commons has media related to History of the European Union. The European Atomic Energy Community is an international organisation established by the Euratom Treaty on 25 March 1957 with the original purpose of creating a specialist market for nuclear power in Europe, by developing nuclear energy and distributing it to its member states while selling the surplus to non-member states. However, over the years its scope has been considerably increased to cover a large variety of areas associated with nuclear power and ionising radiation as diverse as safeguarding of nuclear materials, radiation protection and construction of the International Fusion Reactor ITER. The Economic and Monetary Union (EMU) is an umbrella term for the group of policies aimed at converging the economies of member states of the European Union at three stages. The policies cover the 19 eurozone states, as well as non-euro European Union states.